The truth of the matter is that I never get tired breaking the rules and going wild with mixing patterns. Today's look is no exception. One rule was staying unbreakable: I was keeping the color's tone similar, so I was "feeling blue". And if two patterns weren't enough, I added a floral statement necklace, like a cherry on top of the cake. This outfit screams: Go bold or go home! :-O awesome combination.. blue is my very favorite color and this is just… wow!! THAT BLUE IS BEAUTIFUL ON YOU AND I LOVE THE PLAY ON PATTERN TOO1 THAT NECKLACE IS A GREAT FINISHING TOUCH! HOPE YOU CAN VISIT ME AND FOLLOW ALONG TOO,,,WOULD LOVE O HAVE YOU AS A FOLLOWER..
perfect mix of prints! And as always, beautifully tailored jewelry! Bravo! Wow! beautiful!! I love your blouse! Great outfit! Love the colours, these two prints look so good together! Love your little bag! Minunata combinatia de imprimeuri, arati grozav draga Veronica! i love these patterns together! fab shoes as well! Your necklace and top are superb! OMG what a great print matchy matchy outfit! You look totally incredible amazing! Love how you styled top and skirt with great sandals from marc jacobs and unique necklace! I rreally admire this look! I love your outfit. The top is great. I love the way you mixed those patterns & accesorized them. I love the clashing patterns! You look fabulous! Funny! I posted about mixing patterns too! in my case, flowers and stripes. And as you said: Go bold! lovely look aaand my fav. colour is BLUE !!! I love mixing prints and patents! Ce cute e gentuta, pare de copile, foarte finuta! love this outfit and the curly hair from the previous postlooks awesome! Your blouse and skirt are so pretty. It’s a perfect mix. Love your bag and necklace too. wow! a lot of style today. Hola Veronica muy buenos días estás muy guapa me encanta el look la falda y el top es precioso. Veronica only you can mix prints that fantastically! and the necklace is beyond stunning! This Marni inspired look is the epitome of authentic fashion sense. 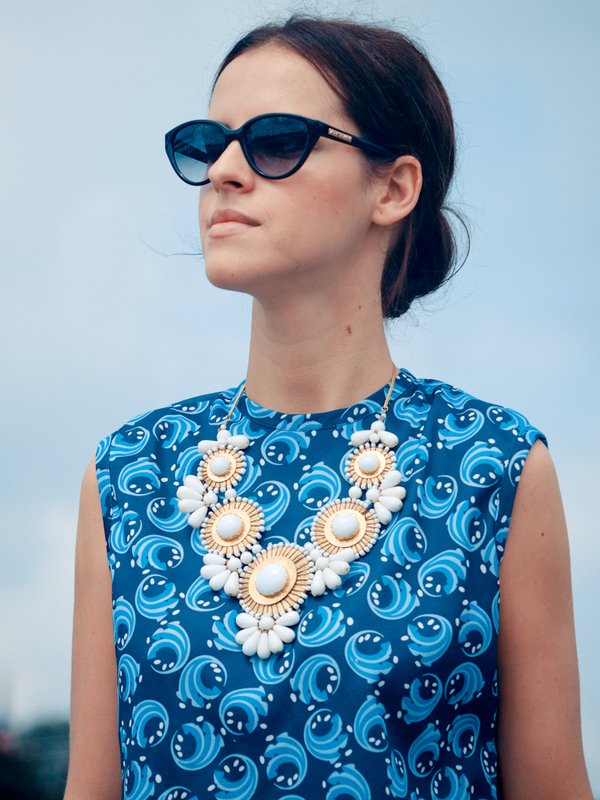 Love the mix of prints and the neckpiece that ties the various blue patterns together in the most cohesive manner!! That skirt is awesome–I love the interlocking patterns.